Our modern, busy lifestyles mean that these days most of us don’t get enough sleep. And whilst we may think we have bigger things to concern ourselves with than being ‘a bit tired’, there is an increasing body of evidence to suggest that actually, we really should start worrying about it. Sleep deprivation can have serious and far reaching consequences. Just ask Elon Musk, of Tesla and SpaceX fame, who hit the headlines recently after he revealed his gruelling 120 hour working week in an interview with the New York Times. That kind of intense work schedule doesn’t leave much time for quality sleep and has been blamed for many of his ill-advised tweets. Most notably in August he stated his intention to take the publicly traded Tesla private. It started a furor in the markets, Nasdaq had to halt trading in the stock and a federal investigation was kicked off. Thankfully, for most of us mere mortals, the fall out from not getting enough sleep wouldn’t be quite that dramatic. But the impact of sleep deprivation on our performance at work is still a very real issue. So how much sleep are we getting? We all know we should be aiming for around 8 hours of sleep a night but various research studies find that generally we are getting much less than that. A recent study in the UK found that Briton’s only manage 6 hours and 19 minutes a night. And it’s affecting how we perform at work. Difficulty concentrating in meetings, taking longer to do stuff, struggling to come up with new ideas, irritability, less motivation… the list goes on. According to the National Sleep Foundation, we spend an average of 4.5 hours working at home every week. This could well be because we are less productive during office hours than we should be. So we take it home, or stay logged on that bit longer, which gives us even less time to squeeze in that precious shut eye. A vicious circle. We all know what it’s like when you wake up from a bad night’s sleep. You’re tired, a bit irritable maybe. But when a bad night’s sleep turns into several bad nights, then you might find yourself feeling under the weather more than you used to be. Sleep deprivation makes you more susceptible to common illnesses such as colds and the flu. If it goes on longer, you open yourself up to a whole host of frighteningly serious problems. Heart disease. High blood pressure. Obesity. Diabetes. If you’re ill, then who is running your business? Not getting enough sleep can also have a profound effect on your mood, the way you feel, and the way you interact with others. You may be irritable, more stressed, with feelings of anxiety and frustration mixed in for good measure. These aren’t particularly good for you in a work environment where teamwork and communication are so important. It’s important to get in sync with your body’s circadian rhythm, it’s natural sleep / wake cycle. 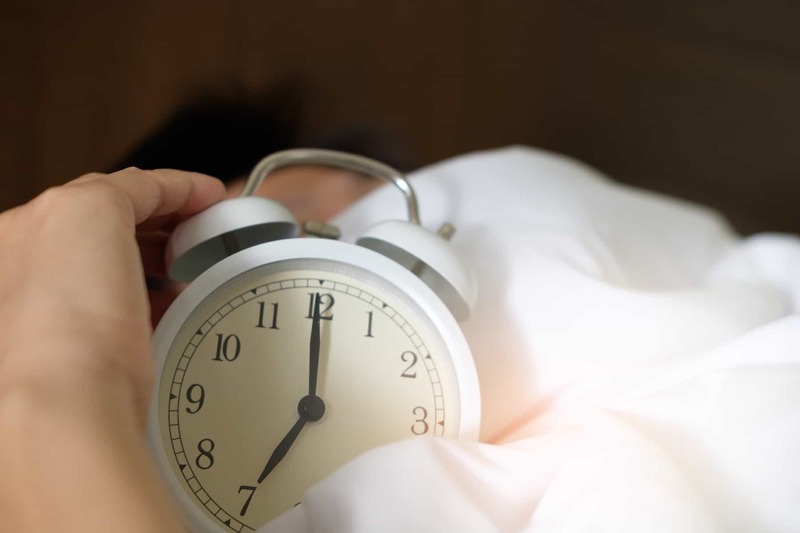 By setting a regular sleep schedule you’ll likely feel more energised and more refreshed than if you got the same amount of sleep at a different time of the day. Try to go to sleep and wake up at the same time every day, even weekends, and choose a bedtime when you naturally feel sleepy. If you’re really getting enough sleep, you shouldn’t need an alarm to wake you up. If you’ve had a late night, try a short nap of 15 – 20 minutes in the early afternoon rather than sleeping in late. That way you’ll make up for some of the sleep you missed without disturbing your natural circadian rhythm. Our bodies naturally produce melatonin, a hormone that is controlled by our exposure to light. It’s wonderful for keeping that circadian rhythm we keep talking about in check. When it’s dark, you produce more of it and it makes you feel sleepy. When it’s light and bright, you make less and so feel much more alert. But modern life is altering our bodies production of melatonin and wreaking havoc on our natural sleep / wake cycles. During the day expose yourself to as much sunlight as you can. Why not eat breakfast sitting by that sunny window in the kitchen rather than at your desk when you get to work? Go outside at lunchtime, or go for a run, or walk the dog. Make your office as light and bright as possible. But when night falls, avoid any kind screen time for at least an hour or two before your bedtime. We’re talking about TVs, laptops, iPads, phones – the whole lot. We’ve all heard about how the blue light our devices emit are hampering our bodies’ melatonin producing efforts. So turn them off or put them down and maybe listen to some music instead. When you do eventually crawl into bed make sure the room is dark. Blackout curtains, a sleep mask maybe. Turn off anything that emits light. And if you need to get up, try not to turn the lights on. Exercising regularly helps you sleep better at night and feel more alert during the day. It speeds up your metabolism, raises your body temperature and stimulates hormones such as cortisol, so make sure you don’t do your workouts too close to bedtime. Ideally, try and finish a couple of hours before you want to go to sleep. You also need to pay attention to what you put into your body, particularly as night falls. Avoid big, heavy meals, reduce your caffeine consumption, avoid alcohol and try and cut back on sugary food and refined carbs. A clear head will help you nod off quicker. But you’ve got lots on your mind; there is just so much to do tomorrow. How are you ever going to manage to fall asleep? You can take a step in right direction by writing down whatever it is that’s on your mind. Whether that meeting tomorrow is stopping you falling asleep, or whether you’re waking up because you’ve just remembered that really important call you need to make in the morning, write it down (on paper, not your phone with it’s pesky blue light) so you can deal with it in the morning. You’re already avoiding late night workouts, you haven’t had any caffeine since lunchtime, you didn’t watch that high octane Tom Cruise film before bed and you haven’t checked Facebook in hours. You even made a list of what was on your mind before you hit the pillow. You’ve had a great night’s sleep. Wonderful! Now try waking up well too. Don’t keep hitting snooze, no matter how tempting those extra 10 minutes may seem. Get up and get yourself going. Get outside, have a coffee, some breakfast, read the news. But don’t jump straight into those emails – allow yourself a little bit of time to enjoy that refreshed, energised feeling first!